The most crucial game of the last round was another loss of top-ranked NSH (9-5) in Sakti on Saturday night. Visitors were defeated by second ranked Bima Perkasa (7-6) 83-78. It may be a crucial game in the contest for the top position in the league. Bima Perkasa shot 30 for 44 from the free-throw line, while NSH only scored fourteen points from the stripe. Bima Perkasa had a 35-21 advantage in offensive rebounds. 32 personal fouls committed by NSH helped opponents get some easy free throw opportunities. Americans were the main players on the court. Forward David Atkinson (203-91, college: Salem Intern.) stepped up with a double-double by scoring 27 points, 10 rebounds, 4 assists and 5 steals for the winners and guard David Seagers (188-88, college: Dowling) chipped in 22 points, 15 rebounds and 4 assists. Guard Dashaun Wiggins (188-91, college: Portland St.) responded with 28 points and 8 rebounds. Both coaches used bench players in such tough game. Bima Perkasa maintains second place with 7-6 record having just three points less than leader Stapac, which they share with Satria Muda. NSH at the other side still keeps top position with five games lost. Bima Perkasa will have a break next round, and it should allow them to practice more before next game. NSH will play at home against Siliwangi and it may be a tough game between close rivals. Very significant was Satria Muda's (#3) 74-63 road victory against 4th placed Hang Tuah. American forward Dior Lowhorn (201-87, college: USF) nailed a double-double by scoring 21 points, 13 rebounds, 9 assists and 6 blocks for the winning side and Jamarr Johnson accounted for 21 points and 12 rebounds. American guard Gary Jacobs (188-92, college: Cent.Washington) came up with a double-double by scoring 29 points and 10 rebounds for Hang Tuah in the defeat. Both coaches tested many bench players which allowed the starters a little rest for the next games. Satria Muda have a solid series of three victories in a row. Defending champion (7-6) moved-up to second place, which they share with Bima Perkasa. Hang Tuah lost third consecutive game. They keep the fourth position with seven games lost. Satria Muda will play against Satya Wacana (#5) in Salatiga in the next round. Hang Tuah will play at home against Pacific Caesar and it may be a tough game between close rivals. In the last game of round 17 Prawira won against Pacific Caesar on the opponent's court 83-73. 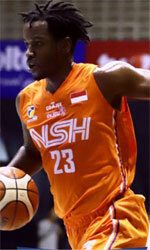 The most impressive stats of the last round was 29 points and 12 rebounds by Dalarian Williams of Prawira. Very significant was Satria Muda's (#3) 74-63 road victory against 4th placed Hang Tuah. They outrebounded Hang Tuah 46-30 including a 32-21 advantage in defensive rebounds. Satria Muda players were unselfish on offense dishing 21 assists comparing to just 6 passes made by Hang Tuah's players. American forward Dior Lowhorn (201-87, college: USF) nailed a double-double by scoring 21 points, 13 rebounds, 9 assists and 6 blocks for the winning side and international forward Jamarr Johnson (193-88, college: Widener) accounted for 21 points and 12 rebounds. American guard Gary Jacobs (188-92, college: Cent.Washington) came up with a double-double by scoring 29 points and 10 rebounds and the other American import forward Jarad Scott (203-95, college: Union, TN) added 15 points and 10 rebounds respectively for Hang Tuah in the defeat. Both coaches tested many bench players which allowed the starters a little rest for the next games. Satria Muda have a solid series of three victories in a row. Defending champion (7-6) moved-up to second place, which they share with Bima Perkasa. Hang Tuah lost third consecutive game. They keep the fourth position with seven games lost. Satria Muda will play against Satya Wacana (#5) in Salatiga in the next round. Hang Tuah will play at home against Pacific Caesar and it may be a tough game between close rivals. The most crucial game of the last round was another loss of top-ranked NSH (9-5) in Sakti on Saturday night. Visitors were defeated by second ranked Bima Perkasa (7-6) 83-78. It may be a crucial game in the contest for the top position in the league. Bima Perkasa shot 30 for 44 from the free-throw line, while NSH only scored fourteen points from the stripe. Bima Perkasa had a 35-21 advantage in offensive rebounds. 32 personal fouls committed by NSH helped opponents get some easy free throw opportunities. Americans were the main players on the court. Forward David Atkinson (203-91, college: Salem Intern.) stepped up with a double-double by scoring 27 points, 10 rebounds, 4 assists and 5 steals for the winners and guard David Seagers (188-88, college: Dowling) chipped in 22 points, 15 rebounds and 4 assists. Guard Dashaun Wiggins (188-91, college: Portland St.) responded with 28 points and 8 rebounds and power forward Anthony Simpson (202-87, college: Kent St.) scored 7 points, 12 rebounds and 5 assists. Both coaches used bench players in such tough game. Bima Perkasa maintains second place with 7-6 record having just three points less than leader Stapac, which they share with Satria Muda. NSH at the other side still keeps top position with five games lost. Bima Perkasa will have a break next round, and it should allow them to practice more before next game. NSH will play at home against Siliwangi and it may be a tough game between close rivals. We cannot really consider it an upset in the game between close teams in Surabaya where 4th placed Pacific Caesar (4-9) was defeated by fifth ranked Prawira (3-8) 83-73. Prawira players were unselfish on offense dishing 21 assists. Americans were the main players on the court also this time. Dalarian Williams (198, college: Life) nailed a double-double by scoring 29 points and 12 rebounds for the winning side and guard Brachon Griffin (185-92, college: Elizabeth City, agency: SDJ Sports) accounted for 16 points, 11 rebounds, 8 assists and 4 steals. Prawira's coach Andre Yuwadi allowed to play the deep bench players saving starting five for next games. Forward Jjuan Hadnot (190, college: Grand View) came up with 26 points, 9 rebounds and 5 assists and forward Qarraan Calhoun (203-86, college: Houston) added 14 points, 15 rebounds, 7 assists and 6 blocks respectively for Pacific Caesar in the defeat. Four Pacific Caesar players scored in double figures. Prawira maintains fifth place with 3-8 record. Pacific Caesar lost third consecutive game. They keep the fourth position with nine games lost. Prawira will have a break next round, and it should allow them to practice more before next game. Pacific Caesar will play on the road against Hang Tuah (#4) in Pandang and it may be a tough game between close rivals.